There are 15 important rivers in Texas and 3,700 distinguished torrents. Rio Grande, Red River, Sabine, Brazos River, Colorado and Pecos River are the major rivers in Texas. Majority of the rivers pour into the Gulf of Mexico. 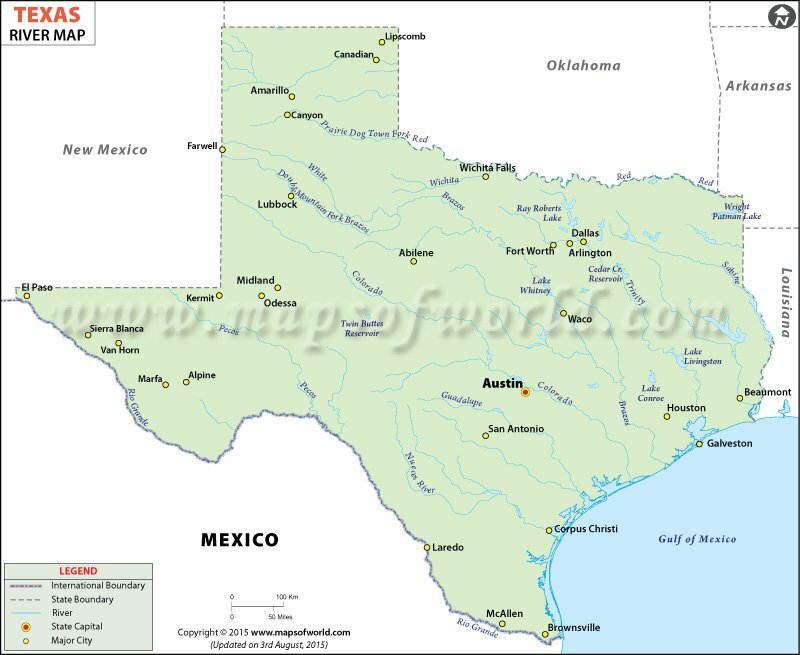 Texas is the second largest US state, located in the south-western region of the country. The state of Texas joined the United States of America as the 28th state in 1845 after gaining independence from Mexico. The state is fed by numerous rivers out of which the majority empty into the Gulf of Mexico. Texas River Map shows the origin and path taken by rivers flowing through the state. Three of its frontiers are demarcated by rivers. There are 15 major rivers and 3,700 distinguished torrents in the state. Some of the major rivers of Texas are described below. You can locate all these rivers on a detailed Texas River Map. The catchment area of the river covers 182,200 sq miles (471,900 sq km). The Red River - The Red River creates a natural boundary with Arkansas and Oklahoma to the north. This famous river is also known as the Red River of the South. It is an important tributary of the Atchafalaya and Mississippi Rivers, lying in the southern region in the United States. The name of the river originates from the red beds of its drainage basin. Its catchment area is the second biggest catchment area in the southern Great Plains. The length of the river is 1,360 miles (2,189 km). The river passes through the U.S. states of Texas, Oklahoma, Arkansas, and Louisiana. The drainage basin of the river covers an area of 65,595 sq miles (169,890 sq km). The Sabine River - The Sabine River creates the natural boundary of Texas with Louisiana to the east. The length of the river is 555 miles (893 km). It pours into the Sabine Lake. The drainage basin of the Sabine River covers 9,756 sq miles (25,270 sq km). Out of this, 7,426 sq miles (19,230 sq km) is located in the state of Texas and the rest is lying in Louisiana. The river traverses a major petroleum-producing area and is often defined as the demarcation between the New Southwest and the Old South. The Pecos River - The source of the Pecos River is situated to the north of Pecos in New Mexico. The length of the river is 926 miles (1,490 km). The Pecos River pours into Rio Grande, close to Del Rio. The watershed of the river covers an area of 44,402 sq miles (115,001 sq km). The Brazos River: The Brazos River is the eleventh longest river in the United States and the longest river in Texas. The length of the river is 1,280 miles and its source is located in the Blackwater Draw, New Mexico. The river empties into the Gulf of Mexico. The river features a catchment area of 44,800 sq miles (116,000 sq km). The Colorado River: The Colorado River is a long river in the state of Texas. It is also the 18th longest river in the country. The length of the river is 862 miles (1,387 km). The source of the river is located in Dawson County. The river runs through Marble Falls, Bastrop, Austin, La Grange, Smithville, Wharton, Columbus, and Bay City. The Colorado River pours into the Gulf of Mexico. The drainage basin of the river encompasses 39,900 sq miles (103,341 sq km).